From the Department of Neurology, University of Regensburg, Germany. A 67-year-old man was admitted to the medical intensive care unit at a hospital in eastern Bavaria. The patient presented with back pain, fever (38.7°C, 101.7°F), disorientation regarding time, place, and his own identity, and drowsiness, all of which had developed in recent weeks. Apart from these findings, the neurologic examination was unremarkable. One day before admission, the patient had been placed on an IV broad-spectrum antibiotic regimen of ceftriaxone and combined piperacillin and tazobactam in response to increased infection parameters. In addition to the man's febrile temperature, his leukocyte count was elevated to 12,500/μL; however, examinations of urea, electrolytes, blood sugar, and liver and thyroid functions yielded unremarkable findings. In the absence of a specific focus from the internal medicine perspective, the possibility of meningoencephalitis was considered. A cranial CT study detected diffuse subarachnoid pneumocephalus with generalized accumulation of gas in the cranial cavities (figure 1). There was no recognizable point of entry for the gas. Brain CT scans reveal multiple foci of gas in the subarachnoid space and ventricles (indicated by arrows). What are the most common causes for intracranial gas? Gas in the cranial vault implies a communication with the external atmosphere or a paranasal sinus. The gas arises when a negative pressure gradient exists across a breach in the skull, skull base, or dura mater.1 Pneumocephalus has been reported after CNS trauma,2 skull fractures,3 neurosurgical procedures,4 barotrauma,5 extension of a pneumomediastinum caused by repetitive positive-pressure activities,6 or an air embolus.7 In the present case, there was no preceding trauma, and the patient had undergone no surgical or diagnostic procedure during the past year. Which diagnostic methods can be of assistance in determining the location of a port of entry and the pathogenicity of the gas? To identify the putative port of entry, we extended neuroimaging of the CNS by performing CT of the whole spine. This study detected gas throughout the entire length of the spinal subarachnoid space (figure 2, A–C). Coincidentally, the scans revealed an unusually radiodense foreign body in the ileocecal junction (figure 2, D–F). There were no signs of bowel perforation or pneumoperitoneum, but there were noticeable amounts of gas in the L5–S1 vertebral disc space (figure 2E). Since the foreign body was found at the same level of the body as this vertebral disc, we assumed a connection between the 2 findings, although gas in a disc space is occasionally found in cases of disc degeneration. CT scans of the whole spinal canal reveal foci of gas in the subarachnoid space from C-2 to S-1 (A–C, D, right arrow) and in the lumbar disc L5–S1 (E). In addition, a radiodense foreign body is located in the ileocecal junction (D, left arrow). A close-up of the CT scout image discloses the foreign body (F). Thereafter, the patient remained febrile (38.9°C, 102.0°F), and a lumbar puncture was performed. Opening pressure was 15 cm H2O and a cloudy fluid was obtained. CSF analysis by light microscopy revealed innumerable superimposed cellular components; cytology demonstrated exclusively neutrophils and some erythrocytes. How did the bacteria find their way into the spinal subarachnoid space? Have we diagnostically and therapeutically reached the end of the story or is there a risk of meningitis relapse? The CSF was primarily composed of a high number of granulocytes in addition to multiple various bacteria. The total protein level was 19 mg/dL and the lactate level was 25 mmol/L. CSF Gram staining revealed the presence of gram-negative and gram-positive cocci and rods; a CSF culture later demonstrated the presence of Enterococcus faecium and Candida krusei—bacteria that are normally part of the gut flora. The patient received ceftriaxone and vancomycin, which produced a remarkably rapid improvement in his consciousness and orientation. 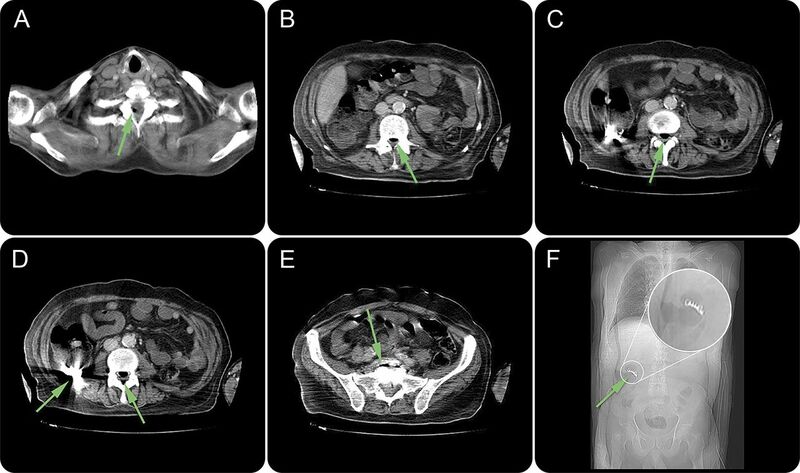 The foreign body was initially suspected to be a clip artifact because the patient's medical history revealed surgical clipping for diverticulitis. A close-up of the CT scout image (figure 2F), however, revealed that the radiodense foreign body was a dental prosthesis projecting into the ileocecal junction. Further inquiry into the patient's history elicited the fact that he had ingested a dental prosthesis 2 weeks prior to admission. The gut microbial spectrum identified in the CSF indicated the presence of an enterodural fistula. We speculated that this could have been caused by an occult bowel perforation. Knowing that on rare occasions intracranial infections from non-gas-producing bacteria can produce gas by putrefaction (due to autolysis of intracellular proteins and glucose decomposition), we postulated the possibility of a link between meningitis and the subarachnoid gas. The other possibility was that the fistula itself was responsible for the subarachnoid gas by allowing gas to pass from the interior of the intestine to the spinal canal. To treat the assumed cause of meningitis and prevent a relapse of that disorder, it was crucial to identify the suspected fistula by open surgical exploration. The patient underwent successful treatment by explorative laparotomy. The enterospinal fistula was identified and resected. The foreign body was delivered by ileocecal resection and consecutive enteroenteral anastomosis. The patient fully recovered within 14 days of antibiotic therapy according to resistogram typing. This case illustrates an uncommon and severe complication of bowel perforation in the form of a putrid meningitis with accompanying pneumocephalus and pneumorrhachis after swallowing a sharp-edged foreign body—in the present case, a dental prosthesis. Pneumocephalus and pneumorrhachis are usually benign and rarely associated with meningitis, which if undetected becomes fatal.8,9 The correct identification of causal links, adequate CSF analysis, and appropriate management with antibiotic therapy are crucial issues in the successful treatment of pneumocephalus and pneumorrhachis associated with infections. Dr. Schömig and Dr. Schlachetzki wrote the paper. Dr. Seliger, Dr. Schulte-Mattler, Dr. Angstwurm, Dr. Fuchs and Dr. Bogdahn revised the manuscript for intellectual content.
. Pneumorrhachis: a rare finding on computed tomography scans. Clin Neuroradiol 2011;21:163–165.
. A rare case of tension pneumocephalus after head trauma. Int J Surg Case Rep 2015;6C:300–302.
. Traumatic pneumorrhachis: etiology, pathomechanism, diagnosis, and treatment. Spine J 2011;11:153–157.
. Symptomatic pneumocephalus after trans-sphenoidal surgery. J Clin Endocrinol Metab 2014;99:2319–2320.
. Barotrauma-induced pneumocephalus experienced by a high risk patient after commercial air travel. J Korean Neurosurg Soc 2013;54:142–144.
. Craniocervical hyperpneumatization with concurrent pneumorrhachis, pneumomediastinum, and subcutaneous emphysema in a weightlifter. Spine J 2013;13:e47–e53.
. How did air get into the brain? A case of intracranial air in a patient without skull fracture. Acta Neurochir 2011;153:1825–1826.
. Severe sepsis due to otogenic pneumococcal meningitis with pneumocephalus without meningeal symptoms. Intern Med 2015;54:1661–1664.
. Localized pneumocephalus caused by Clostridium perfringens meningitis. Br J Neurosurg 1999;13:85–86.